The right business credit card could save your company thousands each year. If travel is a big part of your business, a card that offers travel rewards will help you extract added value from your business expenses. 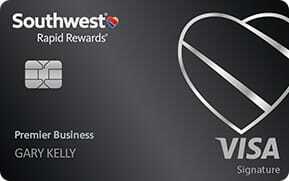 Whether you are rewarded with miles or points, you should select a card that works well with the way you do business. Our experts have identified the best business credit cards for travel rewards. While we name five cards as the overall best for business travel, they may not be the best for your company’s needs. You’ll notice some cards are co-branded with a particular airline, while others are more general, so read on for all the details. The Ink Business Preferred℠ Credit Card is not only an excellent business travel card, it’s a good choice even if you and your employees don’t travel much. It offers points on all purchases without any limit on the amount you can earn. But as a stand-out travel card, it offers triple points on the first $150,000 you spend each year on travel, shipping purchases, cable, internet and phone services, and advertising purchased on search engines and social media sites. The points you earn are transferable 1:1 to most airline frequent travel programs. You increase the value of the points by 25% when you redeem them through Chase Ultimate Rewards for travel. Your points don’t expire, and you can redeem them for cash back, gifts, and more — not just travel. Cardholders who are also MileagePlus Premier members get special upgrades when traveling on an award ticket. You can use your miles for booking flights, inflight WiFi, car rentals, and hotel stays, as well as once-in-a-lifetime events through InsideAccess. You can book a United flight at any time, with no blackout dates or other restrictions. The Capital One® Spark® Miles Select for Business offers unlimited 1.5X miles on every purchase. The miles require no minimum to redeem, and have neither blackout dates nor seat restrictions. For business people with excellent credit, this is a top-tier 0% annual fee travel card with good rewards, free mile transfers to 10+ travel partners, and plenty of other benefits. Benefits include free employee cards and access to Visa SavingsEdge, where you save automatically on qualified purchases. If the card is ever stolen or lost, you’re covered by $0 fraud liability. Travelers will appreciate the card’s auto rental collision damage waiver, travel and emergency assistance, no foreign transaction fees and, naturally, the mobile app. If you’re willing to pay an annual fee of $95 after the first year, the Capital One® Spark® Miles for Business is Capital One’s top small business miles card. It provides 2X miles on all purchases that you can redeem for hotels, flights, vacation packages, and other rewards. You can transfer those miles, without a minimum, usually at a rate of 2 Spark miles for 1.5 airline miles, to Capital One’s 10+ airline partners, all featuring no blackout dates and no seat restrictions. The card offers a generous introductory bonus offer and several business-friendly benefits. Your accounting department will appreciate the ability to download your purchase records in several formats, including QuickBooks. You also get custom, itemized spending reports quarterly and annually to help manage your planning, budgeting, and taxes. For 2019, membership provides you global access to the WeWork network of premium workspaces in more than 75 cities. Hotel benefits include gold status from Hilton Honors and Marriott Bonvoy, plus a $100 hotel credit and room upgrade at any member properties at The Hotel Collection. The card also provides many shopping and entertainment benefits, including Entertainment Access and American Express Preferred Seating, as well as a bevy of business-oriented security and convenience features. The Capital One® Spark® Miles for Business is our experts’ top-ranked business card offering travel miles. You can transfer those miles to more than 10 airline partners, including Air Canada, Finnair, and Qantas. The miles are also good for hotel stays, vacation excursions and other rewards, as well as redemption on the Visa SavingsEdge website. Business-friendly features include fraud protection and interactive alerts to inform you of fraud attempts and protect you with a $0 fraud liability policy. Employee cards are free, and Capital One provides you periodic itemized reports and downloadable purchase records. In addition, you can speak seven days a week to an experienced Spark Business Customer Service Representative who is trained to answer all your questions regarding the card. 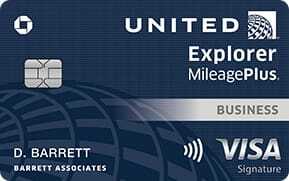 The United Explorer Business Card offers a generous number of bonus miles through its introductory promotion for a very reasonable spending requirement. The card offers many business travel benefits, starting with free checking of your first bag (worth up to $120 roundtrip), two free passes to any airport’s United Club, no foreign transaction fees and priority boarding for cardmembers and their companions. You receive free daily breakfasts, special unique dining or spa benefits, free Wi-Fi, free room upgrades, and special check-in/out times when you use the card to stay at any of the 900+ properties in the Luxury Hotel & Resort Collection worldwide. InsideAccess allows cardmembers to purchase curated, private, once-in-a-lifetime events, such as meeting a sports legend or VIP access to live theater performances. As a cardmember, you’re also entitled to complimentary Visa Concierge Service around the clock, whether you need last-minute event tickets or reservations at an exclusive restaurant. 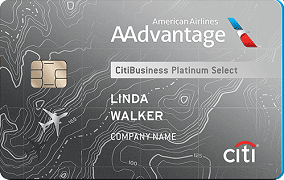 For a surprisingly low annual fee (waived the first year), the CitiBusiness AAdvantage Platinum Select World Mastercard offers many benefits that will appeal to business owners. For as few as 12,500 miles, you can travel for free one-way in the contiguous 48 U.S. states. You can earn a discounted domestic travel American Airlines ticket (fees apply) for a companion for as little as $30,000 in purchases each membership year. Other benefits include a 24/7 personal business assistant to help make travel and dining arrangements, online access to your monthly account summaries and billing statements, and no foreign transaction fees on international purchases. If you and your employees frequently fly with Delta, the many benefits offered by the Delta Reserve for Business Credit Card is likely worth the steep annual fee. 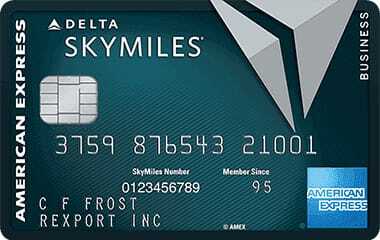 When you take advantage of the introductory bonus offer or simply travel on Delta, you get SkyMiles and Medallion Qualification Miles. The latter determine your Medallion Status and unlock benefits such as better seating, automatic upgrades, and waived baggage fees. The Delta Reserve Card provides other travel benefits, including concierge service and discounts on companion travel. It also serves business owners with the Spend Manager mobile app to notate your transactions, as well as features like additional employee cards with spending tracking, Account Manager to administer your employee cards, and account alerts that help you avoid overdue payments and detect irregular activity. The Capital One® Spark® Miles Select for Business is a no-annual-fee credit card with benefits that rival many fee-based cards. You’re protected by automatic fraud alerts and $0 fraud liability coverage if your card is ever lost or stolen. You can add employee cards at no extra cost and earn rewards from their purchases. The card gives you repair/replace/reimburse purchase security for 90 days and extended warranty coverage for up to one additional year. Travel-related benefits include free miles transfer to more than 10 travel partners, travel and emergency assistance, auto rental collision damage waiver, and no fees for foreign transactions. Your miles don’t expire and don’t impose seat restrictions or blackout dates. The Ink Business Preferred℠ Credit Card offers one of the largest bonus point bonanzas through its introductory three-month promotion. The points don’t expire, and you earn them on every purchase, without limit. You earn 3X points for selected travel and business expenses on the first $150,000 in annual purchases. You receive 125% of your point value when you redeem your points for travel through Chase Ultimate Rewards. You can also transfer the points to most airline rewards programs. The card charges no foreign transaction fees, provides up to $600 protection per claim for cellphone loss or damage, and offers additional employee cards at no cost. 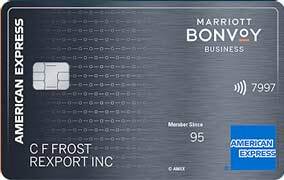 For business travelers who prefer staying at Marriott properties, the Marriott Bonvoy Business American Express Card is a no-brainer. The limited-time introductory offer of 100,000 Marriott Bonvoy points is remarkable (offer ends 4/24/2019), especially for a card with a moderate annual fee. The card awards you one free night every year after your card account anniversary, a 35,000-point value. Cardmembers receive complimentary Marriott Bonvoy Silver Elite status, which upgrades to Gold Elite when you spend $35,000 on eligible purchases within the calendar year. You can earn points with car rentals at Air+Car, and you receive free internet use at all Marriott properties as well as at more than 1 million Boingo hotspots worldwide. Fans of Southwest Airlines will appreciate the rewards available through the Southwest Rapid Rewards Premier Business Credit Card. You can redeem the card’s non-expiring points for Reward seats at more than 100 destinations with no blackout dates. Reward travel includes free first and second checked bags, a $0 change fee, and no hidden fees. The card’s built-in benefits include lost luggage reimbursement of up to $3,000 per passenger and baggage delay insurance of up to $100 a day for three days. You also receive an additional year of warranty protection on eligible U.S. manufacturer’s warranties of three years or less. Goods purchased with the card are covered for 120 days against theft or damage up to $50,000 per account and $10,000 per claim. Cardmembers receive Gold Status from Marriott Bonvoy and Hilton Honors without having to meet any stay requirements. You get higher point rewards for eligible purchases of $5,000 or more, for up to 1 million added points per year. The card provides up to a two-year extension on qualified warranties, annual purchase protection of $10,000 per occurrence and $50,000 per account, and complimentary travel accident insurance for you and your family while traveling on a common carrier. 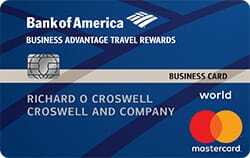 The Bank of America Business Advantage Travel Rewards Card attracts frugal business owners with no annual fee, a low-to-moderate APR for purchases, and a good introductory promotion for new cardmembers. You can earn an extra 25% to 75% reward bonus on every purchase you make when you enroll in the Business Advantage Relationship Rewards Program. You can redeem your points for cash back and gift cards, as well as statement credits to pay for flights, vacation packages, hotels, cruises, baggage fees, and rental cars. You can use your travel rewards to book a trip without any travel restrictions or blackout dates. The card offers sophisticated benefits, including cash flow management tools, a mobile app, overdraft protection on a linked Bank of America business checking account, $0 liability protection and fraud monitoring. How Do I Get a Business Credit Card? Big corporations routinely use business credit cards. But it’s fairly easy for even the smallest businesses to qualify. Perhaps you are a self-employed contractor or a part-time Uber driver. If you are doing anything for a profit (or plan to shortly), you are a small business and you can get a business credit card. A legal name: If you have a separate business name, for instance through a corporation, partnership or LLC, use it on the card application. Otherwise, just use your own legal name. Business description: The application may ask what kind of business you operate, how it is structured, information about beneficial owners (i.e., someone owning at least 25% of the business), and the industry in which you operate. Personal identification: You’ll describe your role in the business (using terms like president, CEO or owner) and provide either your Social Security number or Employee Identification Number. Include your business address, which can be your home address. You’ll also be asked for other personal information such as your household income, birthdate, email address and so forth. Business factoids: You’ll be asked how long you’ve been in business (if you are a startup, enter zero) and the number of people you employ. If you are self-employed, enter “1.” Other important data points will include your annual business revenue (if you are just starting, it’s OK to enter zero) and how much you spend each month on business expenses. To expedite the application, you may have to sign a personal guarantee to repay any credit card debt. It helps to demonstrate a business relationship with a bank. Your personal credit history will have a major impact on the issuer’s decision, but some cards are pickier than others. What’s the Easiest Business Credit Card to Get? The key to getting a business credit card is to convince the issuer of your creditworthiness. You should be able to do so easily if you can demonstrate your revenues exceed expenses over a period of at least two years. If you don’t fall into this group, the card issuer will look to your personal credit history. Your application for a business card will likely be accepted if you have an average or better score and a clean credit report. Suppose your business hasn’t started earning profits, and/or your personal credit score is lacking. In that case, you’ll have a hard time being approved for many of the business travel cards we’ve discussed. However, you do have a couple of options. The Bank of America Business Advantage Travel Rewards Card is our recommendation for the easiest business credit card to get. The Bank of America Business Advantage Travel Rewards Card is our pick for the easiest card to get among the ones mentioned in this article. It has no minimum requirement for credit score and will accept start-up companies. The card charges no annual fee, has an achievable sign-up bonus, and offers a 0% introductory APR on purchases you make during the first nine billing cycles after opening the account. You may also want to look at the Capital One® Spark® Classic for Business. While not a travel-rewards card specifically, it accepts applicants with an average credit level, charges no annual fee, and earns unlimited 1% cash back rewards. The card describes itself as credit-building when you use it responsibly. Your other alternative is to apply for a secured business credit card. You put cash into a special account that acts as collateral if you should miss a credit card payment. If you use the card sensibly, you may be able to graduate to a regular, unsecured card within a year. Which Business Credit Card Gives the Highest Limit? The winner for highest credit limit among the cards in our group goes to the Business Platinum Card from American Express. It has no credit limit – it is a charge card and does not extend credit. Charge cards require you to pay the full balance each month. Failure to do so will result in heavy late fees, and if you make late payments often, your account could be suspended. This doesn’t mean you can spend endlessly with a charge card. A particularly large balance will doubtlessly raise red flags. However, charge cards generally have no preset spending limits. If you demonstrate that you can pay off a large balance each month, the issuer will let you continue to charge substantial amounts on its card. 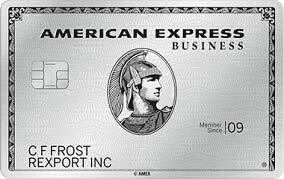 The American Express Business Platinum Card is our recommendation for the business credit card with the highest limit. Many business owners will find the Platinum Card perfect for their needs if their businesses generate enough cash flow to pay the card balance each month and consider the card’s generous rewards well worth the high annual fee. The card acts as a short-term loan (up to one month) with no interest charges. Furthermore, American Express does much of the recordkeeping, including a year-end summary, making it easier to manage your expenses and prepare your taxes. If you prefer a high spending limit on a revolving credit card, check out the Delta Reserve for Business Credit Card. It is issued through American Express and currently offers APRs from 17.99% to 26.99% and comes with a $450 annual fee. Which Credit Cards Get You into Airport Lounges? Seasoned travelers love airport lounges, but not necessarily the entry fee of $50 or more per person. Lounges allow weary business owners and employees to freshen up between connecting flights and offer many business-friendly features, including internet access, workstations, meeting rooms, fax and photocopy machines, personalized message services, and telephone access. If you consider airport lounges important to your business, you may prefer a business travel card that offers complimentary or discounted lounge access and/or lets you pay for access with travel rewards. The Business Platinum Card from American Express: Considered the leader among cards offering lounge access, it provides entree to the American Global Lounge Collection of 1,200+ lounges worldwide, including the Centurion Lounge, Delta SkyClub, and Priority Pass Select networks. Up to three authorized users can receive lounge access for a fee of $175 per year. Delta Reserve for Business: Complimentary access to Delta SkyClub lounges when traveling on Delta. You can invite up to two guests into the lounge for $29 a person. For $175 per year, you can get three additional cards that include lounge access. United Explorer Business Card: You receive two complimentary one-time United Club passes each year, a value worth $100. Even if you don’t carry one of the cards that offers free access to airport lounges, remember that almost all travel cards will let you cash in points or miles for lounge admittance. Check the fine print of the cards you’re considering for details on the number of miles/points required. Every business owner knows that it makes sense to get the most value from every dollar you spend. The best business travel cards do that in spades, and the variety of desirable cards lets you select one that best fits your business goals and your budget. The business travel cards selected by our experts come with annual fees from $0 to almost $600. Most offer generous sign-up bonuses and let you rack up extra rewards for travel-related expenses. Not surprisingly, the cards with the highest fees offer the most generous rewards. But, if you don’t need some of the perks, such as hotel discounts or airport lounge access, you can choose a card with a low or no annual fee and still receive high value. Pay attention to the card basics, such as the APR, fees, bonus rewards, and the business-friendly benefits that should figure heavily into the mix of features that work best for your company.